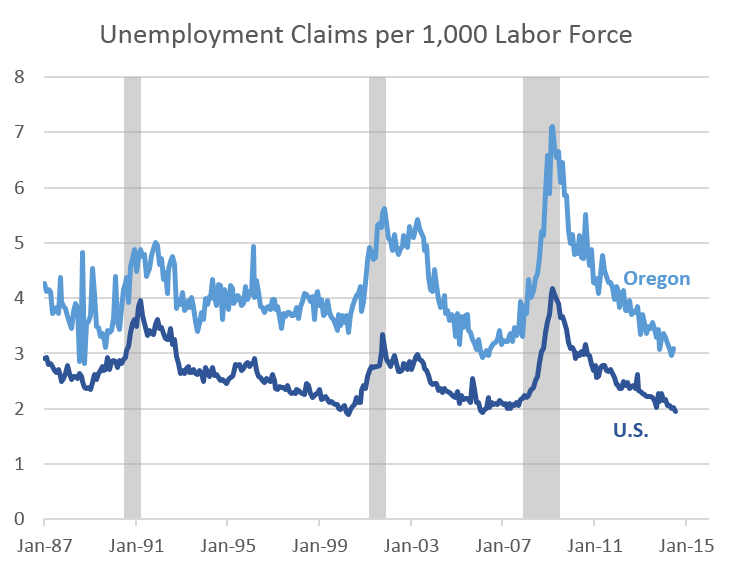 New claims for unemployment insurance at at or near all-time lows in both Oregon and the U.S. This is encouraging in that it shows the level of job loss is currently at very low rates, and effectively as low as during the past expansions. In other words, if you have a job, the probability of losing it is very low today. Of course this does not take into account the continued high levels of the long-term unemployed, or a lower LFPR, which have been detailed previously. As such, the level of unemployment insurance benefits paid out is back down to pre-Great Recession levels. 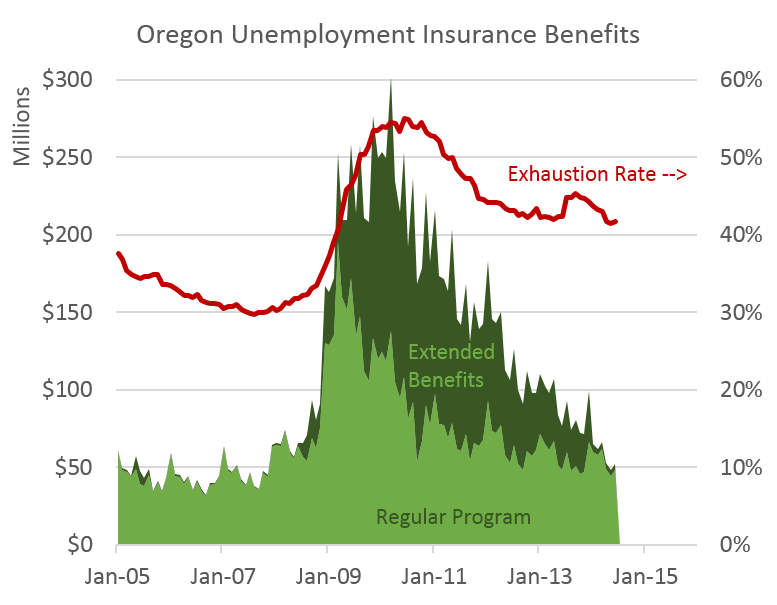 Unfortunately the exhaustion rate — the share of Oregonians who start receiving benefits and reach the end of program without leaving, i.e. do not find a job — is still high, although it is about half-way back. With relatively low levels of job loss, low levels of benefits being paid out and the expiration of the extended benefits at the beginning of the year, the recipiency rate in Oregon is now 34 percent. 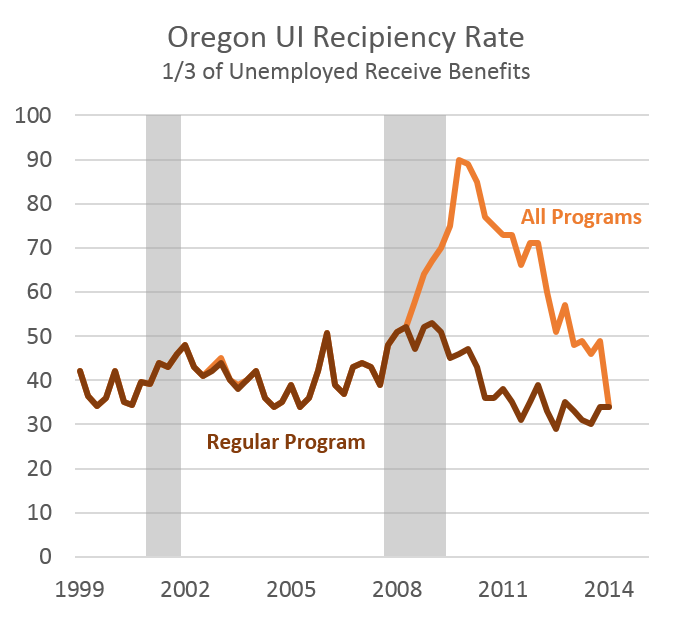 This means that 1 in 3 unemployed Oregonians are currently receiving benefits and 2 in 3 unemployed Oregonians are not. 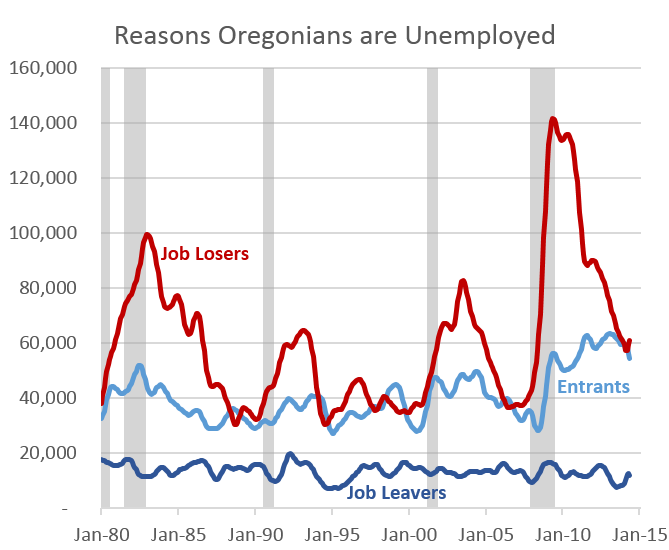 The reason for this is that most unemployed Oregonians today are not job losers (the vast majority of benefit recipients). Most are entrants into the labor market and therefore not eligible for benefits. This is largely a good thing. It indicates that the number of Oregonians losing jobs is lower. It also shows that more Oregonians are looking for work — about 10,000 more in the past 8 months. As the job market continues to improve, it will draw more workers back into the labor force, providing some cyclical rebound. Of course, all of the above speak to the rate and level of job loss in Oregon, which has not been the primary economic issue for a number of years. The problem is the hiring rate. Job growth has accelerated in Oregon unlike the vast majority of the country. However, the rate of growth is still three-quarters throttle relative to historical expansions. Oregon is getting there, however we are still digging out from the Great Recession. This is very interesting data out today from the Oregon Office of Economic Analysis. Job losses have come back down to pre-recession levels. That is the good news. But hiring in Oregon is still below historical levels seen in past recoveries. More people are entering the job market and many are still unable to find work. Therefore, they are not eligible for benefits, resulting in 2 out of 3 unemployed Oregonians not receiving unemployment benefits. And the “exhaustion rate,” i.e., the number of people who reach the end of their benefits without finding a job, is still very high. The data reflect positive growth, but the effects of the recession linger. We know from other data that this impacts communities of color, individuals without a high school credential, and individuals with limited English proficiency in a disproportionately higher rate. The data highlight the importance of continuing to focus our educational outcomes on college and career ready skills for all students in order to equip them for successful transition into an economy that is still struggling to fully recover.